10:45 a.m. What little snow we had this morning is pretty much gone. The roads are bare, but it’s cold out so please be careful of ice. Metro Transit: All of the north Seattle and central Seattle routes are on a normal schedule, other parts of the city/county are on modified schedules. Check this site to get updated info. Seattle Schools: Schools are closed for mid-winter break. SPS sent out a notice that all Mid-Winter Break enrichment classes canceled today. Today: Snow showers south of Seattle with new accumulation up to an inch. Mostly cloudy with flurries Seattle northward. Highs in the lower to mid 30s. North wind 10 to 15 MPH. Tonight Mostly cloudy with a chance of snow showers in the evening. Becoming partly cloudy overnight. Cold. Lows 17 to 24. Northeast wind 5 to 15 MPH. Earlier: It wasn’t the 2-6 inches the forecasters warned us about, but there is a dusting up to an inch on the ground in Ballard this morning. The forecast calls for a trace to 2 inches more later today. Live traffic cameras. Refresh to update. See all North Seattle cameras. Most city streets are bare and wet this morning. Crews from the Seattle Department of Transportation are treating major arterial streets to guard against the formation of ice in advance of the morning commute period. Snowfall last night was highly variable around the city. Beacon Hill, southern Rainier Valley, and higher parts of West Seattle appear to have had the most snow. And WSDOT crews have been busy treating the freeways. For the most part, traffic is moving smoothly. 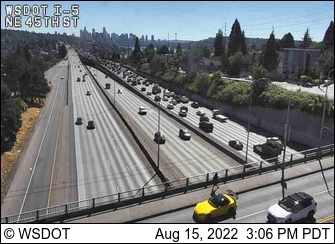 You can check the latest WSDOT traffic updates, the flow map and the full set of WSDOT cameras. In short, it looks like we dodged a bullet, but drive carefully out there. I think it must have snowed everywhere EXCEPT Ballard! I caught a few flurries during the night, but I guess it didn’t amount to much. It’s good that schools (public, anyway) were already closed. I guess there’s still a chance of snow today, but it feels like it’s not meant to be this time. It snowed at our house, but less than an inch. We’re up in Whittier. Hit and run suspect flips car on 15th Ave.